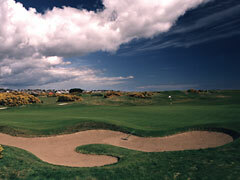 Carnoustie Golf Breaks. The golf at Carnoustie needs no introduction. Championship Course - Host to the Open six times, the Championship Course has been voted the top course in Scotland by many of the golfing greats and has been described as Scotland's ultimate golfing Challenge. The 1999 Open captured the public's imagination as some of the game's greatest players floundered, and will always be remembered for Jean van de Velde's disastrous last hole where he let slip a three stoke lead to lose to Paul Lawrie in the play-off. 18 holes. Par 72. 6,941 yds. Links. Burnside Course - The Burnside Course is ideal for golfers looking for slightly less of a challenge, shorter than its big brother and a great introduction to the exciting world of links golf. 18 holes. Par 68. 6,020 yds. Links. Buddon Course - The Buddon Links Course has been extensively remodelled to make it more enjoyable for the average golfer, although some of the holes would not be out of place on the Championship Course. 18 holes. Par 66. 5,400 yds. Links.